Bill Sanderson at Edmiston sends in the news that he’s now signed a central agency for sale on the 32.9m sailing yacht Avalon. 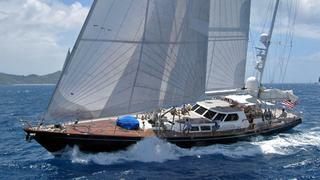 She was built in 1987 by Southern Pacific Yachts in New Zealand to a design by Ron Holland. In 1992, after cruising around the world, she was extended by six feet and her name was changed from Gleam to Avalon and she also received a totally new interior. Avalon has had only two owners since new and accommodates six guests in three staterooms. Lying in Marina Del Ray, Los Angeles, her asking price is $4,450,000.